Only basic ingredients are needed for these Snowy-Topped Brownie Drops. The only ingredient that you may need to go out and purchase is the chocolate. I used a blend of bittersweet chocolate and semisweet chocolate (because I was feeling a little indecisive). The first step is chopping and separating your chocolate. 6 oz are melted with butter, and 2 oz are used as chunks in the cookies. I melted down my semi-sweet chocolate (with a little bit of bittersweet) and had set the bittersweet chunks aside. I melted down my chocolate with the butter using the double boiler method because I really don’t know how to melt chocolate in the microwave! Next, granulated sugar was added to the chocolate. The chocolate mixture was grainy after the sugar was added, but not to worry, the graininess disappeared with the next addition! Eggs made the chocolate smooth again! I added the eggs in one at a time, making sure that they were well-incorporated. It’s hard to see in the photo below, but I threw in some salt and vanilla extract next, as flavor enhancers. I carefully folded in the flour next, only mixing until the flour barely disappeared. I added the reserved chocolate chunks last and mixed them in until they were well-dispersed. After that, I covered the dough (which looked more like brownie batter) and refrigerated it overnight (Dorie wrote to chill it for at least 3 hours). I rolled out little chocolate dough balls and plopped them into a small bowl of confectioner’s sugar and gave the dough a good coating. If you want your cookies to have a lot of cracks, be very generous with the confectioner’s sugar. It was fun rolling the little dough ball around the bowl of sugar. This dough spreads a little, so I had to be mindful of my spacing when I laid the dough balls out on the cookie sheets. In retrospect, I spaced them out too much. These cookies came out of the oven feeling like they were underbaked because the centers were very soft. I was tempted to leave them in the oven longer, but in the end I had faith in Dorie’s instructions. These cookies are great when they’re warm, but they’re still delicious when they’re room-temperature, too. They crisp up as the days go by, so eat them quickly if you like soft-centered cookies! Coarsely chop 6oz of chocolate and finely chop 2 oz of chocolate. Place the coarsely chopped chocolate over the butter in a heatproof bowl, and place the bowl over gently simmering water. Stir the chocolate and butter until they are just melted. Once they are both melted, remove the bowl from the pan. Using a whisk, stir the granulated sugar into the melted chocolate (which will turn the mixture grainy). Add the eggs to the mixture one by one, whisking the batter for one-minute after each egg is added. The dough will become smoother, shinier, and thicker. Whisk in the vanilla and then the salt. Fold in the flour and mix until the flour just disappears. Add the reserved finely chopped chocolate. Cover the dough/batter and refrigerate for at least 3 hours. Put some confectioner’s sugar into a small bowl (you do not need to sift out the lumps). Using a medium cookie scoop, scoop out level portions of dough. Roll each portion out into a ball and drop it into the bowl of sugar. Gently toss the dough around until it’s generously coated. Place the coated ball on one of the baking sheets about 2-inches apart. Bake the sheets one at a time for 12 minutes, rotating the baking sheet after 6 minutes. The cookies will have spread and cracked. After 12 minutes, the cookie’s sides will feel set, but their centers will still be soft. Put the baking sheet on a rack and wait 2 minutes, then carefully transfer the cookies to the rack using a broad spatula and let cool until they are just warm or have reached room temperature. Repeat with the second cookie sheet and the remaining dough. 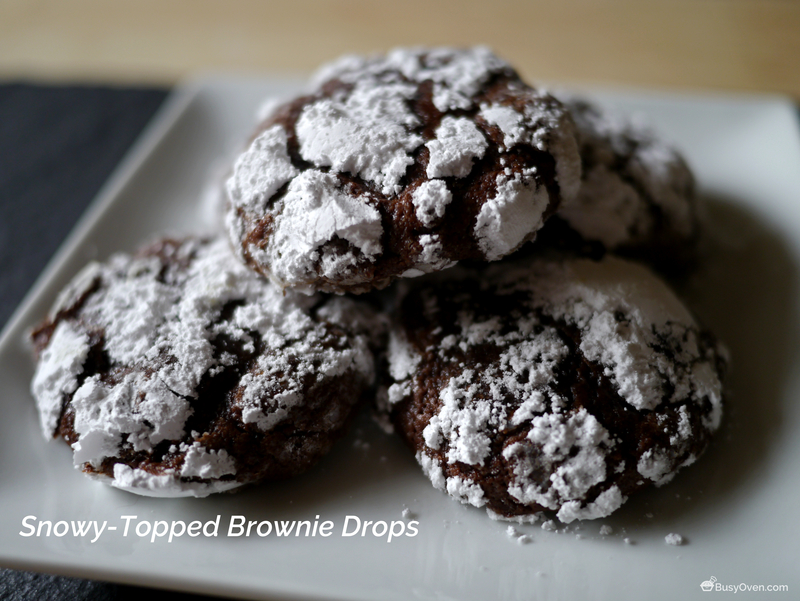 Snowy-Topped Brownie Drops recipe on page 113 of Dorie’s Cookies by Dorie Greenspan.